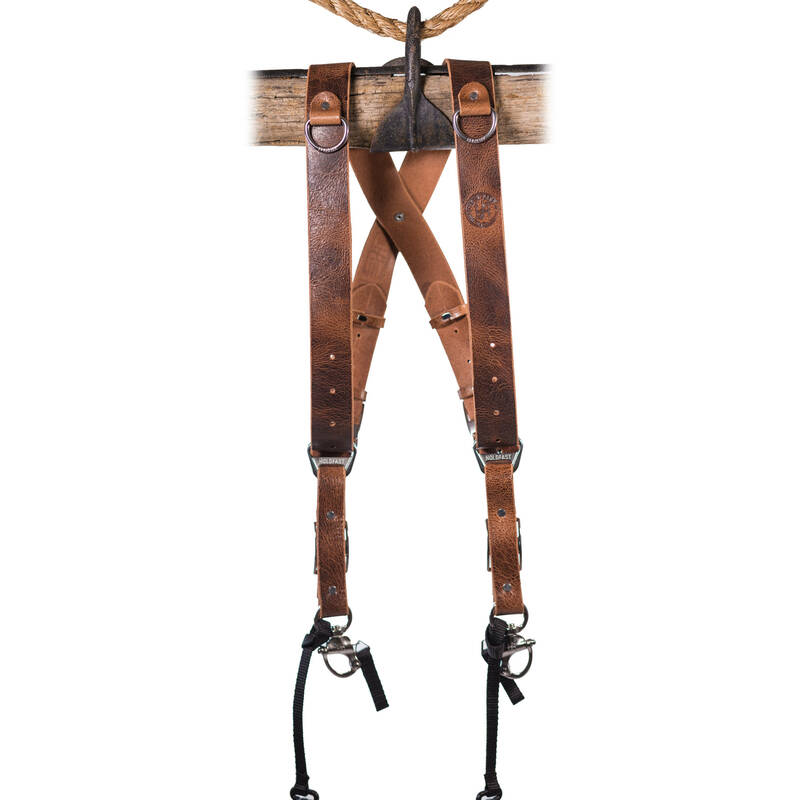 Money Maker 2-Camera Leather Harness (Tan, Black Hardware, Large) is rated 4.9 out of 5 by 8. Rated 5 out of 5 by Johnny T from Stylish and Comfortable I use this product to support two cameras. One is a Nikon D4 with 24 to 70 and the other is a Nikon D3s with a 70-200. This equipment adds up to a lot of weight! When I first received this product I wore it for a six hour wedding shoot. Amazingly, I had no back pain from the heavy load and six hours of shooting! When I put it on I sort of feel like a gangster putting on his holsters armed with my Nikons . The fine leather and riveted hardware is without a doubt durable to take a lot of hard wear and tear. I purchased a double Rapid harness at the same time as this to compare and pick the best. Needless to say the Black Rapid was returned after my six hour trial of the Money Maker. Rated 5 out of 5 by Jareef from Do it!! Absolutely love this holster. I've been wanting it for a very long time, but was sure if I wanted to spend that much money on a camera strap. I finally decided to pull the trigger and I'm SOOO stoked that I did. This strap is awesome in every way. I was going to go for the bridle leather but after seeing the different materials in person side by side I opted for the water buffalo. They both looked and felt good. But the water buffalo quality just had a better look to me. All in all the money maker is definitely worth it hands down. I felt this after only using it once for a wedding. Pick one up trust me your shoulders and back will thank you!! Rated 5 out of 5 by Mark Sv from Great Functionality & Looks Used this to shoot wedding on Nov 1st. Easy to use, no more shoulder and neck pain. Back was a little tight, but this was a 13 hour wedding, and my back only got a little tight near the end of the night. No, I didn't wear the devise for 13 hours straight, but I did have it on from 4:30 - 10:00 PM.I actually opted for the medium instead of the large. I'm 5'8, 185 lbs, with broad shoulders and thick through the chest and back. The large fit well in that sense, but it was just a bit too long, even at the shortest adjustment. The medium works great on my frame. Rated 5 out of 5 by OldPilot from Stylish and very practical. Ive been trying to get hold of one of these two camera harness systems for a while now so thanks B&H. I shoot action photography with a Canon 5DIII+70-200LMk2 on one hip and a Canon 7DII+100-400LMk2 on the other. The harness handles this load very well. Its comfortable and allows quick access. The gear also looks very professional and is wearing very well. Rated 5 out of 5 by Ken the Photographer from Money Maker Two Camera Harness Greatest 2 camera harness on the market. Very comfortable to wear. Rated 5 out of 5 by Vincent from Worth every penny. If you are a dual camera shooter then this strap the best on the market. The clips and all the hardware on the harness are made perfect. The leather is well made. Have not found a defect or blemish on the strap. The weight of the cameras and lens is perfectly distributed. I use two 5d mark IVs with a 24-70 and a 70-200 and I’m comfortable all day. The look of the strap is one of the best parts. The last two events I worked I received at least 3 compliments on the setup. Worth every penny. Rated 4 out of 5 by Christopher from I love the way it looks! Pros: I love the way it looks, it’s great that you can use 2 dslr camera and the easy release is very convenient when removing your camera. Con: I have to remove my battery grip for both of my canon 5d MarkIV with on camera flash cause it’s so heavy with it. My shirt would sometimes get stuck on the loop of the sling.